And now a lame interlude from Cap and Avengers…. I give you…The End of Tartar Sauce! The end of Fear Itself (major letdown of a big time comic event) left us without a thunder god. Odin sent himself into exile. Freya, Odin’s wife, is now the All Mother, ruler of Asgard and trying to unite all the nine realms into Asgardia (puke). Thor’s birthmother, Gaea, and Idunn, another female, join Freya as rulers and advisors, apparently. Karnilla the Norn Queen, evidently ticked off because Balder isn’t the man anymore, uses her magic to replace Thor’s presence and history with a new thunder dude: Tartar Sauce…er, Tanarus. But, get this…Thor ain’t exactly dead. No, his soul is in the maw of the Demogorge….and, he is starting to remember who he is/was. The Silver Surfer and Loki(!?!) team up to reunite Thor with Mjolnir. Oh, and Tartar Sauce is revealed to really be Ulik the Troll. 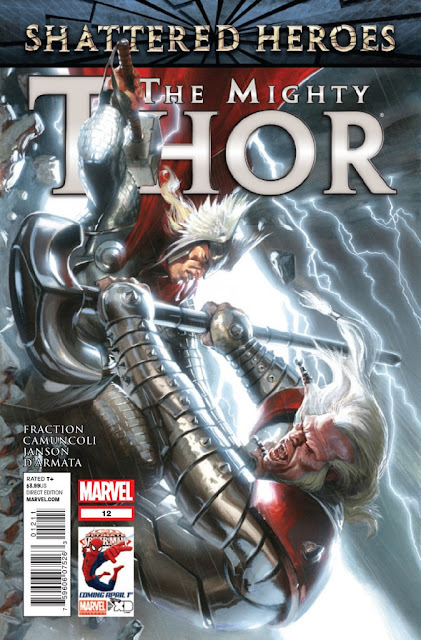 He and Karnilla stand revealed and declare war on Asgard(ia). Get all that? Me neither. Thor is back. Thor is back. That is about the good in this one. I must admit I didn’t follow this book post-Fear Itself because of Tartar Sauce, and knowing Thor wouldn’t stay dead (after all, the Avengers is coming out in May!). The art is passable, but not great. The lettering at times reminds me of the good ol days of the 1980s, as well as the Ron Frenz runs. Tartar Sauce? Really? Freya, long an afterthought, now a female badarse? Come on. Fraction is showing that his status as a Marvel architect should be revoked…that is,unless you are building deathtraps and not buildings. The art is ok, but at times this looks more like a book drawn for little kids than a multi age appropriate comic. It is laughable that such a great cover is on this book, when inside you mostly get art that is better suited to archie than Thor. The concept of Asgardia is lame. The whole thing of Fear Itself and its aftermath is a huge disappointment. The sooner we get back to even the Copiel Thor, much less the Simonson or Frenz, the happier I will be. Until noted otherwise, don’t bother with Thor. Give the book to Ron Frenz or someone like him who understands and gets the essence of the character and what fans want. I would give it a zero,but at least Thor returns…and, no Cable.